Metro S Hooks Security are used to attach an add on unit to a starter unit. Two Metro S Hooks Security are required per shelf level. 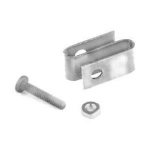 The security S-hooks use a screw and nut to secure the shelves in place. Therefore, this secures the shelves to one another. Additionally, shelves can not be moved without unscrewing the security S hook.